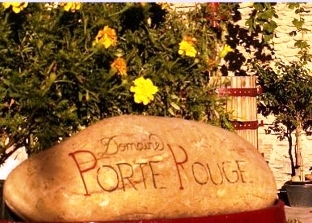 Domaine Porte Rouge is one of the newer estates in the Southern Rhone Valley. In fact, it only dates back to 2001, when Bernard Friedmann created the estate. However, the name of domaine has a history. The estate, located in the village of Chateauneuf du Pape took its name, which is translated into Red Gate, from the previous entrance that led to the village of Chateauneuf du Pape. Prior to owning Domaine Porte Rouge, Bernard Friedmann knew about the wine trade, but on the retail end, not as a wine maker, as he worked for a negociant for years. The first bottling for Domaine Porte Rouge was produced from the very hot, 2003 vintage. One of the first decisions the new owner, Bernard Friedmann did was to bring in the well-known consultant, Philippe Cambie. The vineyards of Domaine Porte Rouge are farmed completely organically. They were certified as Agriculture Biologique in 2014 by Ecocert. Domaine Porte Rouge owns a tiny, 2.5 hectare parcel of vines in the Chateauneuf du Pape appellation. The vineyard is spread out among 6 different parcels. The vines are old, with an average age of close to 60 years. However, they have some old vines that are approaching 90 years of age, which is quite respectable. The vineyard is planted to 85% Grenache and 15% Syrah. Domaine Porte Rouge produces one red Chateauneuf du Pape wine. Domaine Porte Rouge Chateauneuf du Pape is often close to 100% Grenache. Small amounts of Syrah and Mourvedre can also become part of the blend, depending on the vintage. Young vine Grenache and other varietals are destemmed. Old vine Grenache is always whole cluster fermented. The wine is aged in a combination of used oak barrels and stainless steel tanks for between 18 months and 24 months prior to bottling. The production is close to 750 cases of wine per vintage. Domaine Porte Rouge can be enjoyed on the young side. Young vintages can be popped and poured, or decanted for about 1 hour. Older vintages might need very little decanting, just enough to remove the sediment. Domaine Porte Rouge is usually better with 2-4 years of bottle age. Of course that can vary slightly, depending on the vintage. In the best vintages the wine should be consumed within 3-10 years after the vintage. Domaine Porte Rouge is best served at 15.5 degrees Celsius, 60 degrees Fahrenheit. The cool, almost cellar temperature gives the wine more freshness and lift. Domaine Porte Rouge is best served with all types of classic meat dishes, veal, pork, beef, lamb, duck, game, roast chicken, roasted, braised, stewed, and grilled dishes, smoked meats, barbecue, grilled meats, barbecue, sausage, cassoulet, eggplant and tomatoes. Domaine Porte Rouge is also good with Asian dishes, hearty fish courses like tuna, mushrooms, cheese, pasta and cheese. Light in color and in fruit, the wine is dominated by its red berry center. Soft and forward, the ripe, bright kirsch and wild strawberries are already accessible. This will definitely be best in its youth. Medium bodied, soft and accessible, the sweet red fruits are easy to find in this Grenache dominated blend. Medium bodied, soft and forward, this easy drinking wine ends with a spicy, kirsch filled finish. Medium bodied, fresh, red fruits, herbs and pepper creates an open, bright, raspberry filled, spicy wine that drinks well young.